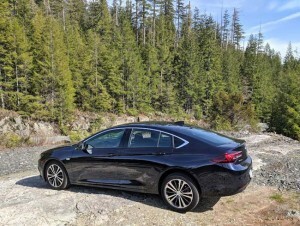 General Motors has lofty ambitions for the 2018 Buick Regal Sportback. All-new for the 2018 model year, the Regal Sportback is a dramatic move for the Buick brand. Overall the Sportback is 2 inches longer than the previous model Buick Regal. Interestingly, the wheelbase has grown a whopping 3.5 inches. The extra length in wheelbase serves a number of purposes; a longer wheelbase with provide a smoother ride, extra room for rear seat passengers and visually pleasing anchors for the sleek sportback shape. The stylish exterior mimics a four door coupe design with the difference being a rear cargo area accessed by a subtly integrated lifting rear hatch. GM stresses this is not a hatchback given the term usually implies a sharper rear window angle. The sloping rear window truncates with a metal deck that looks the part of a typical trunk lid. The obvious advantage here is the ability to make full use of the rear cargo area as the entry point is much larger than a typical trunk pass-through. The Buick Regal Sportback provides 892 litres of storage in the rear hatch with the rear seats in place. Buick has adopted a neat 40/20/40 folding rear seat arrangement on all sportback models. With all seats folded down, the Sportback’s cargo capacity jumps up to 1718 litres. The flexible folding rear seat arrangement allows for longer items such as lumber or perhaps skis to be carried along with a compliment of passengers. The rear seat design is a tip off to something quite novel about the Sportback, the integrated ability to carry skis is something found in many European cars and makes sense with this vehicle as it was designed and built in Germany. 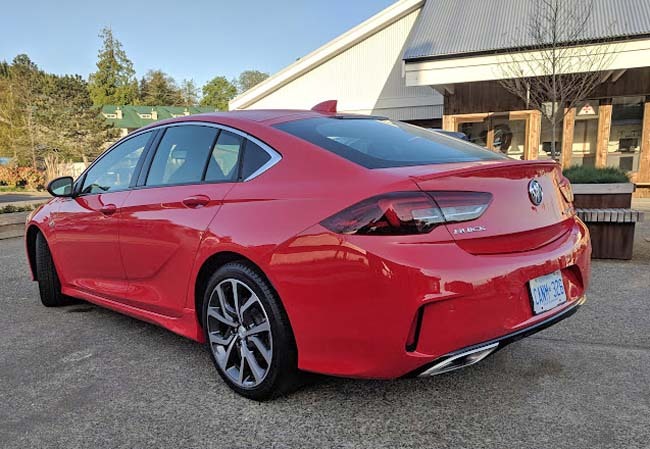 Buick has gone to lengths to compare this vehicle to another German sedan, The Audi A5 Sportback. While other Sportback models exist, Buick sees the Audi as its spiritual competition. The Buick comes with a choice of two engines, a 2.0L turbo four cylinder and a 3.6L V6. The 4 cylinder engine produces 250HP and 295 lb-ft of torque. The front wheel drive models utilize the 9-speed dual clutch transmission (with the engine detuned to 260 lb-ft of torque) while the all-wheel-drive models are supplied with an 8-speed dual clutch unit. The V6 engine, available only on the GS trim, produces 310 horsepower and 282 lb-ft of torque and is tied to a different 9-speed dual clutch transmission. Standard across the Sportback lineup are safety features such as ten airbags, a rear vision camera displayed on an 8-inch screen. Rear park assist, rear cross traffic alert and a lane departure assist with blind spot monitoring is also available in a package that includes LED headlamps. A second equipment package includes Adaptive cruise control, a following distance indicator, Forward collision alert, forward automatic braking, lane keep assist and front pedestrian braking. One feature standard on all Buick Regal Sportbacks, is an active hood safety feature. When the vehicle senses a pedestrian collision, pyrotechnic charges, similar to airbag deployment technology, fire at the rear of the vehicle’s hood, raising it up about 10 cm, to allow for a cushioning effect upon impact. While the 2018 Buick Regal Sportback model has been on sale in Canada for a few months, the new model in our test drive is the sportier GS trim level. 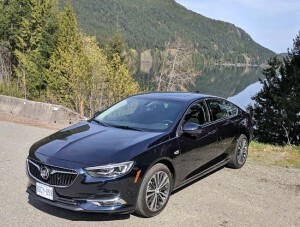 For comparison purposes, Buick had 4-cylinder Essence models for us to drive one way between Nanaimo to Tofino and GS units for the trip in the other direction. Our first stint was in the Essence AWD model. The drive from Nanaimo to Tofino is an incredibly scenic route. The first leg up to Port Alberni is a typically sedate route with mostly rural highway and some divided highway roads to traverse. Upon passing Port Alberni, you begin to weave through tightly winding mountain roads, with a number of sharp blind bends and curves. 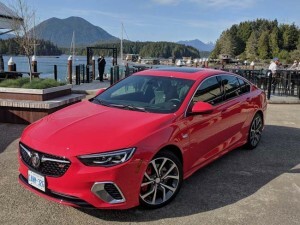 Most striking about the “regular” Regal Sportback, is how capable and quick the car is. The throttle response of the turbo $ cylinder engine is immediate and the combination of the suspension and all-wheel-drive system felt entertaining and surefooted. The Regal is based on a European model and it clearly hasn’t lost any of its Euro road manners in the North American translation. The suspension on the 4 cylinder models utilizes conventional McPherson struts with coils springs up front and a 5 link rear suspension on the AWD models. The FWD units carry a four link rear suspension but as stated, none of these units were available for our drive. the vehicles were equipped with active noise control and Continental Conti-silent tires were fitted on the car we were driving. These tires use a foam core within the tire structure to lessen road noise by as much as 10db. Oddly, the main noise heard on the cabin was tire noise. Wind and basic engine noise were imperceptible under normal driving conditions. Under hard engine acceleration, the engine was pleasantly audible. For our return drive we slipped into the Regals Sportback GS model. Other than the GS badging up front and on the rear, red Brembo brake calipers and chrome tipped exhaust pipes signalled the more aggressive nature of the GS. Inside the cabin, the GS markings, flat bottomed sports steering wheel and obviously upscale sports seating let you know that things were going to be different. About those seats, they are equipped with adjustable side bolsters, thigh supports, both heating elements and cooling vents, as well as outfitted with massaging hardware. The seats have also been certified by a group of German chiropractors as being top performers. Yes they really are special! I made use of the massaging feature for most of the ride back. On the road, the throaty engine note of V6 engine adds to the sporty flavour of the GS. Because of the use of continuously variable electronic suspension dampers, drivers can choose just how much spice they want in their GS experience. At a default setting the GS rides pretty much the same as the already lovely base models. Console mounted buttons allow the driver to step up to a sport mode or full on, GS mode. Each step upwards sharpens the throttle response, transmission shift points, exhaust note and suspension stiffness. The added bonus of the active suspension dampers is a smoother and much flatter ride through the twisty sections of the mountains leaving Tofino. The performance upgrade of the GS was most noticeable through this section of the drive. While it may not matter to all who are considering this vehicle, in addition to the impressive cargo capacity, the rear seats are not only quite comfortable but there is a surplus of legroom for the rear passengers even with the front seats set for drivers north of 6 feet tall. Despite the obvious pluses listed so far, the lack of steering mounted paddle shifters on the GS model is a curious omission as is a power rear lift-gate feature. The only caveat being these features are available on some of the Regal’s competitors at significantly higher prices. 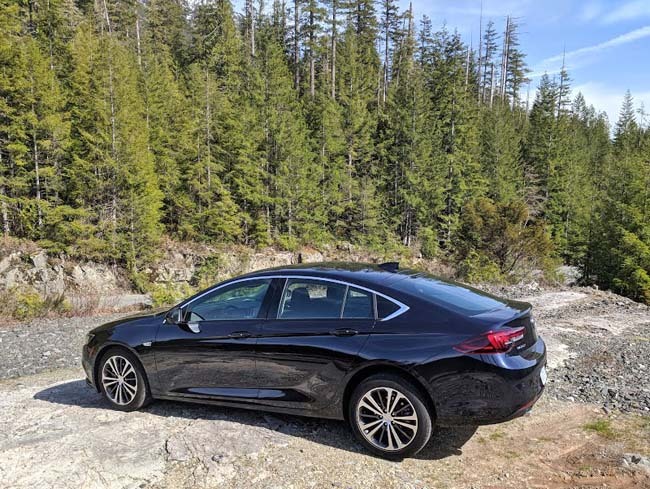 The entry level 2018 Buick Regal Sportback is the Preferred II FWD which starts at $31,845. The Essence AWD starts at $37,345 and the GS AWD model starts at $43,845.